Optimizing Throughput is the goal of any foundry and a source of consistent wax patterns is a key factor in achieving this goal. Pattern consistency depends on a supply of viscosity consistent wax. While the concept of a consistent supply of conditioned wax is simple – achieving it requires a comprehensive approach. Let’s trace the flow of wax from the supply source to the die. Wax is melted at a rate matching production throughput. Our reservoir does it all… from liquid to paste. As conditioned wax is used to produce patterns, MPI’s Wax Level Control automatically and continuously replenishes the wax conditioning reservoir. The source can be either direct melt or pumped from a remote source. Frequently introducing small amounts of hotter source wax into the wax conditioning reservoir ensures the best process control. Our reservoir does it all… from liquid to paste. It accurately conditions wax to optimum temperature +/- 2F (+/- 1C), providing consistent results from pattern to pattern regardless of the source wax temperature. These units are designed to condition up to 200 lb. (90 Kg.) of wax per hour. MPI delivers the tightest temperature control in the industry. The MPI 5-Zone, Temperature-Control System monitors wax temperature at specific locations, providing the most accurate temperature control with the highest throughput in the industry. By maintaining a set temperature through all zones, we are able to achieve extraordinary pattern-to-pattern repeatability. Our Wax-Conditioning Reservoir accurately conditions wax to optimum viscosity, providing consistent results from pattern to pattern regardless of the source-wax temperature. 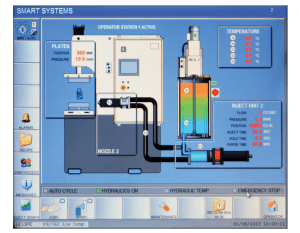 We achieve highly controlled injection results through precise temperature management utilizing our Flex-noz® Injection Nozzle… an industry best. Flexible, controlled injection results are achieved through precise temperature control. Horizontal parting line and through the platen injection are available. 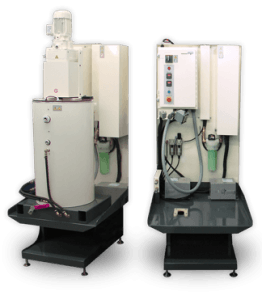 SMART PURGE™ is a unique wax re-circulating system that is only available on MPI injection machines. It provides the most accurate injection process control in the industry by circulating wax through the entire injection system. Smart Purge™ puts the wax in a dynamic state supplying fresh homogeneous wax from the reservoir to the nozzle tip prior to injection. Repeatable wax patterns equals improved foundry casting throughput. While the value of repeatable patterns is simple to understand, achieving the goal depends on two complex and interrelated systems – wax preparation and process control. Repeatable patterns can only be achieved through consistent wax viscosity injected at repeatable wax flows and pressures. MPI prides itself as being the world leader in this technology.